Alton sophomore Alyson Haegele delivers a pitch to the plate during her one-hit shutout of the Roxana Shells on Thursday at Roxana Park. The results from a 3-2 start suggests 2019 could bring a step back for an Edwardsville Tigers softball program that has averaged more than 30 wins a season over the past dozen years. Alton coach Dan Carter remains skeptical. The Alton Redbirds have never won a Southwestern Conference championship. They have not won a regional championship since 2006. But if Edwardsville, which has won the last five SWC titles while going 64-6 in league play, comes back toward the pack, a conference crown could be in play for the Redbirds. They will not, however, be alone with those aspirations. The Tigers have won the SWC eight times in the past 10 years, with that string interrupted only by O’Fallon’s back-to-back titles in 2011-12. And the Panthers are the most likely late-March pick to be the team that may knock off the Tigers. O’Fallon opened SWC play Tuesday with a 3-1 win over Belleville West to improve to 8-0. But the 5-2 Redbirds, who beat East Side 18-0 Tuesday at AHS, hope they have the pitching to stay relevant in the race. Carrying the pitching load for the Redbirds will be sophomore Alyson Haegele, freshman Emma Kiger and junior Abby Scyoc. Haegele has earned the No. 1 role with a 3-0 record and 2.85 ERA from a staff-high 19 2/3 innings. 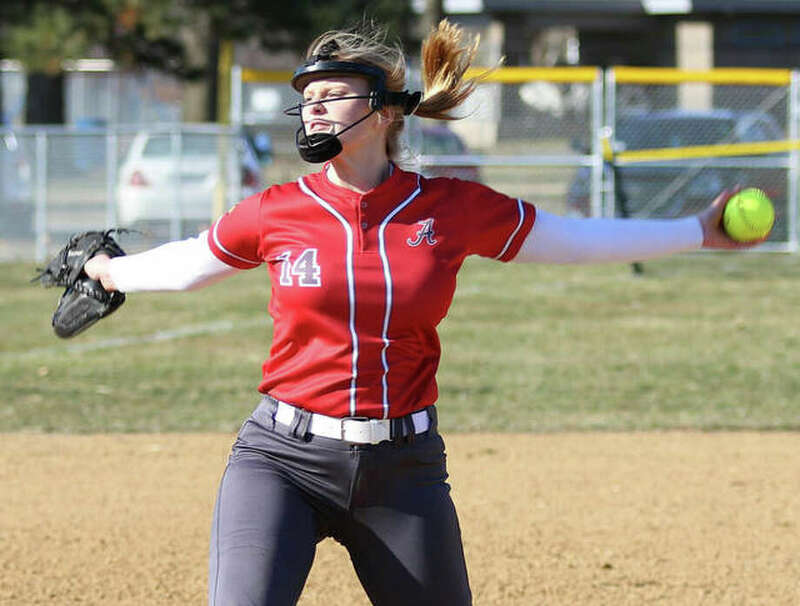 Her best outing came in a 12-0 five-inning shutout Thursday at Roxana. The Redbirds are young, but do have experience. The lone senior starter will graduate in May as one of the program’s greatest players. Tami Wong hit .496 last season after hitting .509 as a sophomore. Those averages rank Nos. 1-2 all-time for Alton. “Great experience there,” Carter said of his senior shortstop. Wong (.524) is one of six Redbirds that started the week hitting better than .400, with Haegele at .538 leading a group including Abby Sullivan (.471), Kiger (.450), Ashlyn Betz (.412) and Lynna Fischer (.400). Catcher Audrey Evola is flirting with .400 at .389. Betz, a junior first baseman who hits third, has two homers and eight RBIs, while cleanup hitter Kiger has a team-leading 10 RBIs. Betz and Scyoc are juniors that both have started since they were freshmen. The rest of the lineup is filled by underclassmen, including freshmen Kiger and Evola. The Redbirds finished 17-17 last season, halting a string of five consecutive 20-victory seasons. Getting back to 20, its coach believes, is a reasonable goal for Alton. “I definitely think so,” Carter said.